Railway Recruitment Boards are scheduled to conduct NTPC 2nd stage exam in January 2017. Earlier Pre exam was held from 28 March to 30 April 2016. RRBs conducted written examination for the posts of Station Master / Goods Guard etc. posts under CEN 03/2015 between 28 to 30 April 2016. It was an online computer based examination for which candidates have to mark their answers on the computer screen. Options will be shown on the screen among whom one is the correct answer. Also there is negative marking applicable. The result of RRB NTPC 2nd stage exam is to be announced on 26 May 2017. Earlier Indian Railway via its various RRB had completed the application process for 18252 posts under centralized employment notification no. 03/2015. Numerous posts had been advertised under Non-Technical Popular Categories (Graduate) viz. Assistant Station Master, Goods Guard, CA, TA etc.. Eligible candidates have submitted their applications online up to 25 January 2016. Here are the official RRB Websites list where you can check the result status and doc. verifi. schedule / merit list & cut off marks. Jammu and srinagar www.rrbjammu.nic.in "
Various regions result had been announced as shown above. The link is given below. Bilaspur Railway had released the notice regarding answer key of the examination. RRB Allahabad had notified via a notice stating that the processing of results is still under confidential process. Candidates will be suitably informed by the Administration at the appropriate time. It was such a popular recruitment that around 1 Crore candidates have applied. This shows the popularity of Railway & Govt jobs among the youth of India. Here are the posts which will be filled through the result of RRB NTPC. Selection is totally on the basis of merit in this examination. There is no interview component. You can check the result by visiting the official RRB websites given below. You will find the latest updates information on this page regarding RRB Result of NTPC Exam held for 18252 posts. UPResultsAdmitJobs.in will be updating you on the status of result and document verification schedule to be held thereafter. Candidates can check their result for the exam from the link given below after declaration. Also All the boards will declare their NTPC Document Verification Schedule. Each Railway Recruitment Board will declare the result on its official website as soon as it gets processed. That RRB will then release the list of shortlisted candidates for doc verification. Successful candidates whose roll no. are in result pdf have to appear for that. 20 Railway Recruitment Boards located in various regions in India are to fill these posts. Those candidates who want to appear for ASM, Goods Guard CEN 03/2015 exam in their respective region, can check their result and find their Document Verification Schedule from here. The result of ASM, Goods Guard, CA, TA, ECRC etc. Online exam is to be based on the basis of performance in this single stage examination. Selection is purely based on merit in this CBT exam. Those who qualify will be called for document verification but for Goods Guard posts, skill test / typing test will be conducted before doc. verification. The RRB NTPC Online exam have 100 Multiple Choice Objective Type questions in English, Hindi, Urdu and local languages. Time given to solve paper is 90 minutes and there is 1/3 negative marking applicable. Questions in the online exam have been based on the following sections. At first, Boards will call 18252 candidates will be called for doc. verification. Around 9126 candidates will be put in the waiting list (standby). They may be given chance in case of non-availability of candidates. The result will be available at various regional websites and you can easily check it from below given link. 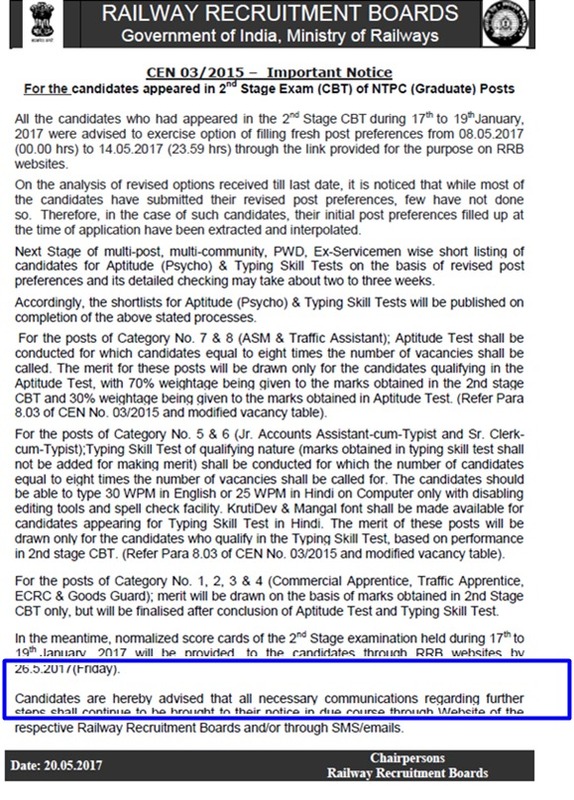 Each applicant have to appear for a common CBT (Computer Based Test) for all 09 categories of posts followed by qualifying Skill (Typing) Test or Aptitude Test, wherever applicable followed by Document Verification for which schedule will be declared along with results. Candidates can check their ASM & Goods Guard result for written examination from the direct link given below. Many number of candidates applied and appeared for this recruitment exam. The test was held at following Railway Recruitment Boards of India. Ahmedabad, Ajmer, Allahabad, Bangalore, Bhopal, Bhubaneswar, Bilaspur, Chandigarh, Chennai, Gorakhpur, Guwahati, Kolkata, Malda, Mumbai, Muzaffarpur, Patna, Secunderabad, Siliguri, Thiruvananthapuram. The result of is expected to be announced from June 2016 onwords. Each Railway Recruitment board will be declaring its Railway result of NTPC exam separetely on its official website. 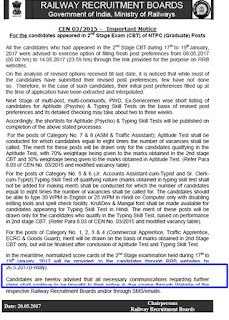 The result will have list of roll numbers of those candidates who have qualified the exam and have been shortlisted to appear for document verification and typing test (wherever applicable). Result date: From June 2016 onwords. Where to check result: They will be available at regional websites given below. Each applicant can check their result by visiting the website links given here. Candidate need to visit the website and then click on the RRB NTPC result link given there. Then they need to download the pdf and find their roll number in the list of shortlisted candidates. The result pdf will also have document verification schedule in it as well as other important details.